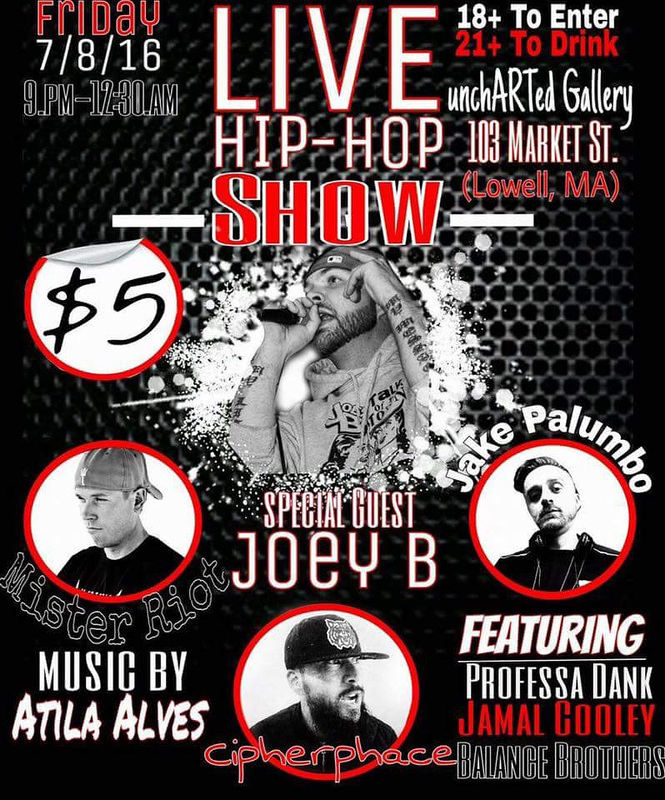 Friday, July 8th the all-new UnChARTed Gallery (103 Market Street, Lowell, MA) will be hosting a live hip hop show & art exhibition beginning at 9pm. Featured performers include SpaceLAB Recordings’ own Jake Palumbo & Ciphurphace, who will likely perform a few selections off their 2013 collaborative LP Moonshine Burrito. Also performing on the bill is Arizona wordsmith Mister Riot, & local acts Joey B, Professa Dank, & Balance Brothers. The show is $5 at the door, 18 + Up to Enter, 21 + Up to Drink. We will have Jake Palumbo, Ciphurphace & Moonshine Burrito CD’s, t shirts, stickers, postcards, & download cards available at the show for purchase. Previous post Rock Mecca “Prizefights” #1 Hip Hop Record on College Radio!